Every year GUWLI holds the Women in Business Annual Conference. The conference agenda includes a series of impressive speakers as well as workshops on how women can better position themselves as future business leaders, on top of ample networking opportunities. 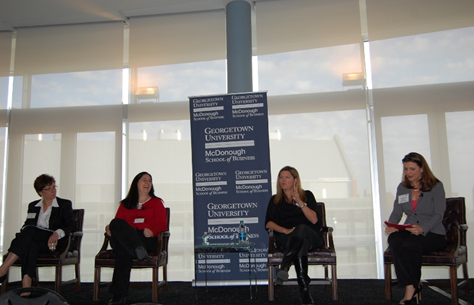 Georgetown University hosted its Annual Women in Business Conference on November 30, 2012, in partnership with GUWLI. The event drew over a hundred participants, including MBA and other graduate students from Georgetown, faculty, staff, alumni, business leaders from the community and prospective students. Jill Smart, Chief Human Resources Officer at Accenture, started off the day with an inspiring conversation about her own professional and personal successes, the importance of mentorship and ethics in business. Sally Robling, President of Birds Eye Frozen Foods (a division of Pinnacle Foods), shared her views on the direction of the consumer packaged goods industry and how businesswomen can climb the corporate ladder. Lisa Mayr of LivingSocial, Carol Nevins of Merrill Lynch and Julie Zarenko of Under Armour also shared their insights and advice. Attendees learned valuable negotiating and public speaking skills in interactive workshops led by Professor Catherine Tinsley and Adjunct Professor Sara Gershman. 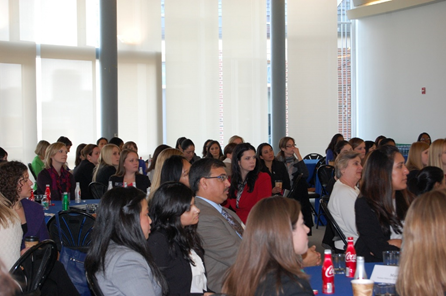 Deans David Thomas and Elaine Romanelli also discussed preparing women for leadership in global business. 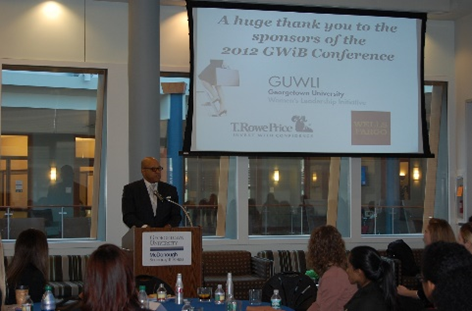 In addition to GUWLI, other conference sponsors included Wells Fargo Securities, TRowe Price and Deloitte Consulting.